A competent collection of drive emulations at a bargain price. Reasonably priced. Useful selection of pedals modelled. Cool GUI. 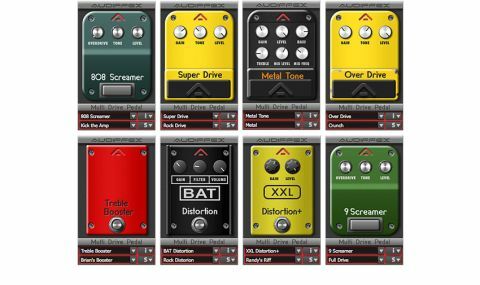 In Multi Drive Pedal, Czech Republic-based Audiffex has released a separate set of eight modelled stompbox plug-ins that are improved versions of those found in its ampLion amp simulation software. The plug-ins are available in standard formats (VST/AU/ RTAS), so they can be used in any computer-based DAW. "They capture the vibe, and are very effective at adding distortion to any recorded audio"
The emphasis here is on drive pedals, so you get emulations of a RAT, TS808 and TS9 Tube Screamers, MXR Distortion+, Boss OD-1 and SD-1 overdrives, Boss MT-2 Metal Zone and a treble booster, all with a cute GUI that lets you tweak the knobs and has a working footswitch and on/off light. No-one is going to say that these sound exactly like the pedals, but they capture the vibe, and are very effective at adding distortion to any recorded audio. As with the real thing, they are at their best for guitar when used in front of amp/ speaker simulation plug-ins, which creates a flexible tonal combination for overdrives. If you record on computer, you may well already have the likes of AmpliTube or Guitar Rig, with their full complement of pedals, but adding these will give you an extra range of flavours that can be added to the signal chain. But if you don't have full amp sim software and could do with incorporating some distortion into your recorded tracks, this is a relatively inexpensive way to add some.